Browsing: / Home / Best Lasagna Recipe! Lasagna, one of the most popular Italian staple foods has a long and rich history. The term comes from the Greek word “lasagnum” which means bowl or dish. This recipe is believed to have come from Italy but the term “lasagna” has a Greek origin. The word was used by the Italians for the dish in which it was prepared and very soon name of the Italian recipe took the name of the dish in which it was served. This dish was initially featured in the first English cookbook, resulting in the legend that British Isles was the place of origination. The dish is a lot about fresh ingredients, particularly the cheeses. Few recipes have several different cheeses but typically ricotta and mozzarella cheese are used. Some of the favourite recipes include Lasagna alla Bolognese and Lasagna Verdi. Nutmeg is used in some versions of this Italian recipe. 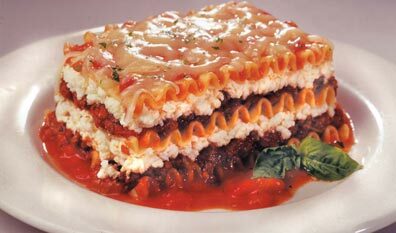 Ingredients Lean ground beef – 1 pound Spaghetti sauce – 1 (32 ounce) jar Cottage cheese – 32 ounces Mozzarella cheese – 3 cups ( shredded ) Eggs -2 Parmesan cheese – 1/2 cup ( grated ) Dried parsley – 2 teaspoons Salt- taste Black pepper ( ground ) – taste Lasagne noodles -9 Water – 1/2 cup Method 1.Brown the ground beef in a large skillet over medium heat and drain out the grease. Pour spaghetti sauce into it and simmer for about 5 minutes. 2.Take a big bowl and mix cottage cheese, mozzarella cheese (2 cups), eggs, Parmesan cheese (1/4th cup), dried parsley, black pepper and salt. 3.Assemble in 9×13 inch baking dish by evenly spreading 3/4 cup of the sauce mix at the bottom. Place 3 uncooked noodles and pour 1/4 cup sauce and 1 3/4 cups of cheese mixture over it. Create 2 such layers. Sprinkle remaining Parmesan and mozzarella cheese as well as the sauce over the noodles. Add water along the edges of the pan and cover the dish with aluminium foil. 4.Bake the Italian recipe in a 350 degree F preheated oven for about 45 minutes. Bake it for another 10 minutes after removing the cover. Allow the dish to rest for 10 minutes prior to serving.